આંખ એ સજીવનું જોવા માટેનું અંગ છે. આંખને નેત્ર, નયન, નેણ, લોચન તરીકે પણ ઓળખવામાં આવે છે. આંખો પ્રકાશને ઓળખી તેનું ન્યુરોન્સમાં થતા ઈલેક્ટ્રોકેમિકલ ઈમ્પલ્સમાં રૂપાંતર કરે છે. ખૂબ જ સાદા ફોટોરિસેપ્ટર્સ પ્રકાશને જાગૃત દ્રશ્યમાં થતા હલનચલન સાથે જોડે છે. ઉચ્ચ કક્ષાનાં ઓર્ગેનિઝમ્સમાં આંખ એક કોમ્પલેક્ષ સિસ્ટમ છે જે આસપાસથી પ્રકાશ ભેગો કરી તેની તીવ્રતાને રેગ્યુલેટ કરી; સ્થિતિસ્થાપક લેન્સીસનાં આયોજન વડે કેન્દ્રિત કરી ચિત્ર બનાવે છે; આ ચિત્રનું ઈલેક્ટ્રિકલ સિગ્નલમાં રૂપાંતર કરી મગજને આંખની ઓપ્ટીક નર્વ સાથે જોડતાં કોમ્પલેક્ષ ન્યુરલ માર્ગો દ્વારા મગજનાં વિઝ્યુઅલ કોર્ટેક્ષ અને બીજા ભાગોમાં મોકલાવે છે. પ્રકાશનાં ચિત્રીકરણની ક્ષમતા ધરાવતી આંખો મુખ્યત્વે દસ પ્રકારની છે અને ૯૬% પ્રાણીસૃષ્ટિ સંકુલિત દ્રષ્ટિ યોજના ધરાવે છે. મોલ્યુસ્ક, કોર્ડેટ અને આર્થરોપોડ પ્રાણીઓ ચિત્રીકરણ કરતી આંખો ધરાવે છે. સાદામાં સાદી આંખો, જેમ કે સુક્ષ્મજીવોની આંખો પ્રકાશની હાજરી અથવા અંધકાર આ બે જ સ્થિતિ ઓળખી શકે છે. આટલી માહિતી તેમની રાત અને દિવસ સાથે જીવનનો તાલ મેળવવા માટે પૂરતી છે. વધુ કોમ્પલેક્ષ આંખો તેમનાં રેટીનલ ફોટોસેન્સિટીવ ગેન્ગલીયન કોષો દ્વારા રેટીનોહાઈપોથાલ્મીક માર્ગનો ઉપયોગ કરી સુપ્રાકીયાસ્માટીક ન્યુકલી ને રાત અને દિવસનાં ચક્ર વિષે માહિતી પહોંચાડે છે. કોમ્પલેક્ષ આંખો આકાર અને રંગનો તફાવત પારખે છે. ઘણાં સજીવોના, ખાસ કરીને શિકારી જીવોના, દૃષ્ટિક્ષેત્રોમાં ઊંડાણની પરખ માટે વિસ્તૃત બાઈનોક્યુલર દૃષ્ટિ સંકળાયેલી હોય છે, જ્યારે બીજા જીવોમા આંખોનું સ્થન એવુ હોય છે જેથી ખૂબ જ મોટું દૃષ્ટિક્ષેત્ર મળે, જેમ કે સસલાં અને ઘોડા, જેમની મોનોક્યુલર દૃષ્ટિ છે. ૬૦ અબજ (૬૦૦ મિલિયન) વર્ષો પહેલા, કેમ્બ્રિયન વિસ્ફોટના ગાળામાં પ્રથમ પ્રોટોચક્ષુ ઉદભવ્યા હતા. પ્રાણીઓનાં સૌથી જૂનાં પૂર્વજો જરૂરી દૃષ્ટિ માટે બાયોકેમિકલ સાધનો ધરાવતાં હતાં અને વધુ અગ્ર કક્ષાની આંખો ૯૬% પ્રાણીની ત્રીસથી વધુ પ્રજાતિઓમાંથી છ  મુખ્ય ફાયલામાં ઉદભવી હતી. મોટા ભાગના વર્ટીબ્રેટ અને કેટલાક મોલ્યુસ્કમાં આંખો પ્રકાશને અંદર આવવા દઈ તેને આંખના પાછળના ભાગમાં આવેલી રેટીના નામની પ્રકાશ-સંવેદનશીલ કોષોની બનેલી પેનલ પર દર્શાવે છે. રેટીનાનાં શંકુ કોષો (રંગ માટે) અને દંડ કોષો (આછા પ્રકાશનાં કોન્ટ્રાસ્ટ માટે) પ્રકાશને પારખી તેનું દૃષ્ય માટેનાં ન્યુરલ સંદેશાઓમાં રૂપાંતર કરે છે. ત્યાર બાદ આ દૃષ્ય સંદેશાઓ ઓપ્ટીકલ નર્વ દ્વારા મગજને પહોંચાડવામાં આવે છે. આવી આંખો ગોળાકાર હોય છે જે વિટરસ હ્યુમર નામનાં પારદર્શક ચીકણા પદાર્થથી ભરેલી, પ્રકાશને કેન્દ્રિત કરતા લેન્સ ધરાવતી, ક્યારેક આઈરિસવાળી, આઈરિસની આજુબાજુનાં સ્નાયુઓને આકુંચિત કે શિથિલ કરીને પ્યુપિલની સાઈઝ બદલી આંખમાં પ્રવેશતા પ્રકાશની માત્રા રેગ્ય્લેટ કરે છે, અને જ્યારે પૂરતો પ્રકાશ હોય ત્યારે એબરેશન ઘટાડે છે. આર્થરોપોડ પ્રાણીઓમાં જોવા મળતી કમ્પાઉન્ડ આંખો અનેક સાદાં પાસાંઓની બનેલી હોય છે જેની સંખ્યા શરીરની રચના પ્રમાણે નક્કી થયેલી હોય છે. આ કમ્પાઉન્ડ આંખો અનેક ટપકાંવાળી એક જ છબી બનાવે છે અથવા એક આંખની એક તે મુજબ અનેક આંખોની અનેક છબીઓ બનાવે છે. આંખનાં દરેક પાસાંનો પોતાનો લેન્સ અને પોતાનાં પ્રકાશસંવેદનશીલ કોષો હોય છે. કેટલીક આંખો ૨૮,૦૦૦ સુધીનાં ષટકોણાકાર માં ગોઠવાયેલાં પાસાં ધરાવે છે અને ૩૬૦ અંશનો દૃષ્ટિવ્યાપ ધરાવે છે. કમ્પાઉન્ડ આંખો દૃષ્યમાં થતા નાજુક ફેરફારને પણ પારખે છે. અનેક આંખો દ્વારા મળતી દૃષ્યની માહિતી મગજમાં જોડાઈને જૂદી જાતનું અત્યંત સ્પષ્ટ ચિત્ર બનાવે છે. મેન્ટીસ નામ્ના ઝીંગા સોથી જટીલ રંગ-દ્રશ્ય રચના ધારાવે છે. તે ઝીણવટ ભરેલી આત્યંતિક રંગપટલ ભેદની માહિતીનું વિશ્લેષણ કરે છે. હાલના સમયમાં લુપ્ત એવા ટ્રાયલોબાઈટ પણ વિશિષ્ટ પ્રકારની સંયુક્ત આંખો ધરાવતા હતા. તેઓ તેમની આંખના લેન્સના નિર્માણ મટે સાફ કેલ્સાઈટાના સ્ફટિકો વાપરતા હતા. અહીં તેઓ મૃદુ આંખો ધરાવતા અન્ય સન્ધિપાદ વર્ગના પ્રાણીઓથી જુદા પડતા હતા. આ પ્રાણીઓમાં લેન્સની સંખ્યા ભિન્ન હતી. અમુક જાતિમાં એક લેન્સ હતું, જ્યારે અમુકમાં એક આંખમાં હજારો લેન્સ હોઈ શકતાં. For example, jumping spiders have a large pair of simple eyes with a narrow field of view, supported by an array of other, smaller eyes for peripheral vision. Some insect larva]]e, like caterpillars, have a different type of simple eye (stemmata) which gives a rough image. Some of the simplest eyes, called ocelli, can be found in animals like some of the snails, which cannot actually "see" in the normal sense. They do have photosensitive cells, but no lens and no other means of projecting an image onto these cells. They can distinguish between light and dark, but no more. This enables snails to keep out ofજ direct sunlight. In organisms dwelling near deep-sea vents, compound eyes have been secondarily simplified and adapted to spot the infra-red light produced by the hot vents–in this way the bearers can spot hot springs and avoid being boiled alive. Photoreception is phylogenetically very old, with various theories of phylogenesis. The common origin (monophyly) of all animal eyes is now widely accepted as fact. This is based upon the shared anatomical and genetic features of all eyes; that is, all modern eyes, varied as they are, have their origins in a proto-eye believed to have evolved some 540 million years ago. The majority of the advancements in early eyes are believed to have taken only a few million years to develop, since the first predator to gain true imaging would have touched off an "arms race". Prey animals and competing predators alike would be at a distinct disadvantage without such capabilities and would be less likely to survive and reproduce. Hence multiple eye types and subtypes developed in parallel. The very earliest "eyes", called eyespots, were simple patches of photoreceptor protein in unicellular animals. In multicellular beings, multicellular eyespots evolved, physically similar to the receptor patches for taste and smell. These eyespots could only sense ambient brightness: they could distinguish light and dark, but not the direction of the lightsource. Through gradual change, as the eyespot depressed into a shallow "cup" shape, the ability to slightly discriminate directional brightness was achieved by using the angle at which the light hit certain cells to identify the source. The pit deepened over time, the opening diminished in size, and the number of photoreceptor cells increased, forming an effective pinhole camera that was capable of dimly distinguishing shapes. There are ten different eye layouts—indeed every way of capturing an optical image commonly used by man, with the exceptions of zoom and Fresnel lenses. Eye types can be categorized into "simple eyes", with one concave photoreceptive surface, and "compound eyes", which comprise a number of individual lenses laid out on a convex surface. Note that "simple" does not imply a reduced level of complexity or acuity. Indeed, any eye type can be adapted for almost any behavior or environment. The only limitations specific to eye types are that of resolution—the physics of compound eyes prevents them from achieving a resolution better than 1°. Also, superposition eyes can achieve greater sensitivity than apposition eyes, so are better suited to dark-dwelling creatures. Eyes also fall into two groups on the basis of their photoreceptor's cellular construction, with the photoreceptor cells either being cilliated (as in the vertebrates) or rhabdomeric. These two groups are not monophyletic; the cnidaria also possess cilliated cells,  and some annelids possess both. In the eyes of most mammals, birds, reptiles, and most other terrestrial vertebrates (along with spiders and some insect larvae) the vitreous fluid has a higher refractive index than the air, relieving the lens of the function of reducing the focal length. This has freed it up for fine adjustments of focus, allowing a very high resolution to be obtained. As with spherical lenses, the problem of spherical aberration caused by the lens can be countered either by using an inhomogeneous lens material (See Luneburg lens. ), or by flattening the lens. Flattening the lens has a disadvantage; the quality of vision is diminished away from the main line of focus, meaning that animals requiring all-round vision are detrimented. Such animals often display an inhomogeneous lens instead. As mentioned above, a refractive cornea is only useful out of water; in water, there is little difference in refractive index between the vitreous fluid and the surrounding water. Hence creatures that have returned to the water—penguins and seals, for example—lose their highly curved cornea and return to lens-based vision. An alternative solution, borne by some divers, is to have a very strongly focusing cornea. 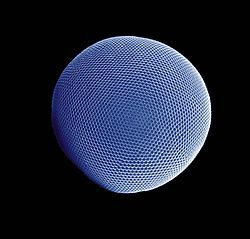 A compound eye may consist of thousands of individual photoreceptor units or ommatidia (ommatidium, singular). The image perceived is a combination of inputs from the numerous ommatidia (individual "eye units"), which are located on a convex surface, thus pointing in slightly different directions. Compared with simple eyes, compound eyes possess a very large view angle, and can detect fast movement and, in some cases, the polarization of light. Because the individual lenses are so small, the effects of diffraction impose a limit on the possible resolution that can be obtained (assuming that they do not function as phased arrays). This can only be countered by increasing lens size and number. To see with a resolution comparable to our simple eyes, humans would require compound eyes which would each reach the size of their head. The second type is named the superposition eye. The superposition eye is divided into three types; the refracting, the reflecting and the parabolic superposition eye. The refracting superposition eye has a gap between the lens and the rhabdom, and no side wall. Each lens takes light at an angle to its axis and reflects it to the same angle on the other side. The result is an image at half the radius of the eye, which is where the tips of the rhabdoms are. This kind is used mostly by nocturnal insects. In the parabolic superposition compound eye type, seen in arthropods such as mayflies, the parabolic surfaces of the inside of each facet focus light from a reflector to a sensor array. Long-bodied decapod crustaceans such as shrimp, prawns, crayfish and lobsters are alone in having reflecting superposition eyes, which also have a transparent gap but use corner mirrors instead of lenses. The vitreous is the transparent, colorless, gelatinous mass that fills the space between the lens of the eye and the retina lining the back of the eye. It is produced by certain retinal cells. 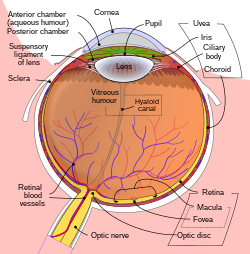 It is of rather similar composition to the cornea, but contains very few cells (mostly phagocytes which remove unwanted cellular debris in the visual field, as well as the hyalocytes of Balazs of the surface of the vitreous, which reprocess the hyaluronic acid), no blood vessels, and 98-99% of its volume is water (as opposed to 75% in the cornea) with salts, sugars, vitrosin (a type of collagen), a network of collagen type II fibers with the mucopolysaccharide hyaluronic acid, and also a wide array of proteins in micro amounts. Amazingly, with so little solid matter, it tautly holds the eye. Of course, for most eye types, it is impossible to diverge from a spherical form, so only the density of optical receptors can be altered. 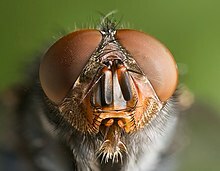 In organisms with compound eyes, it is the number of ommatidia rather than ganglia that reflects the region of highest data acquisition. :23-4 Optical superposition eyes are constrained to a spherical shape, but other forms of compound eyes may deform to a shape where more ommatidia are aligned to, say, the horizon, without altering the size or density of individual ommatidia. Eyes of horizon-scanning organisms have stalks so they can be easily aligned to the horizon when this is inclined, for example if the animal is on a slope. 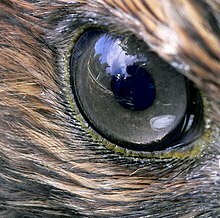 An extension of this concept is that the eyes of predators typically have a zone of very acute vision at their centre, to assist in the identification of prey. In deep water organisms, it may not be the centre of the eye that is enlarged. The hyperiid amphipods are deep water animals that feed on organisms above them. Their eyes are almost divided into two, with the upper region thought to be involved in detecting the silhouettes of potential prey—or predators—against the faint light of the sky above. Accordingly, deeper water hyperiids, where the light against which the silhouettes must be compared is dimmer, have larger "upper-eyes", and may lose the lower portion of their eyes altogether. Depth perception can be enhanced by having eyes which are enlarged in one direction; distorting the eye slightly allows the distance to the object to be estimated with a high degree of accuracy. Visual acuity, or resolving power, is "the ability to distinguish fine detail" and is the property of cones. It is often measured in cycles per degree (CPD), which measures an angular resolution, or how much an eye can differentiate one object from another in terms of visual angles. Resolution in CPD can be measured by bar charts of different numbers of white/black stripe cycles. For example, if each pattern is 1.75 cm wide and is placed at 1 m distance from the eye, it will subtend an angle of 1 degree, so the number of white/black bar pairs on the pattern will be a measure of the cycles per degree of that pattern. The highest such number that the eye can resolve as stripes, or distinguish from a gray block, is then the measurement of visual acuity of the eye. "Colour vision is the faculty of the organism to distinguish lights of different spectral qualities." All organisms are restricted to a small range of electromagnetic spectrum; this varies from creature to creature, but is mainly between 400 and 700 nm. This is a rather small section of the electromagnetic spectrum, probably reflecting the submarine evolution of the organ: water blocks out all but two small windows of the EM spectrum, and there has been no evolutionary pressure among land animals to broaden this range. The most sensitive pigment, rhodopsin, has a peak response at 500 nm. Small changes to the genes coding for this protein can tweak the peak response by a few nm; pigments in the lens can also filter incoming light, changing the peak response. Many organisms are unable to discriminate between colours, seeing instead in shades of grey; color vision necessitates a range of pigment cells which are primarily sensitive to smaller ranges of the spectrum. In primates, geckos, and other organisms, these take the form of cone cells, from which the more sensitive rod cells evolved. Even if organisms are physically capable of discriminating different colours, this does not necessarily mean that they can perceive the different colours; only with behavioural tests can this be deduced. Cones are responsible for colour vision. They require brighter light to function than rods require. In humans, there are three types of cones, maximally sensitive to long-wavelength, medium-wavelength, and short-wavelength light (often referred to as red, green, and blue, respectively, though the sensitivity peaks are not actually at these colours). The colour seen is the combined effect of stimuli to, and responses from, these three types of cone cells. Cones are mostly concentrated in and near the fovea. Only a few are present at the sides of the retina. Objects are seen most sharply in focus when their images fall on the fovea, as when one looks at an object directly. Cone cells and rods are connected through intermediate cells in the retina to nerve fibres of the optic nerve. When rods and cones are stimulated by light, the nerves send off impulses through these fibres to the brain. ↑ ૧.૦૦ ૧.૦૧ ૧.૦૨ ૧.૦૩ ૧.૦૪ ૧.૦૫ ૧.૦૬ ૧.૦૭ ૧.૦૮ ૧.૦૯ ૧.૧૦ ૧.૧૧ ૧.૧૨ ૧.૧૩ ૧.૧૪ ૧.૧૫ ૧.૧૬ ૧.૧૭ ૧.૧૮ ૧.૧૯ ૧.૨૦ ૧.૨૧ ૧.૨૨ ૧.૨૩ ૧.૨૪ ૧.૨૫ ૧.૨૬ ૧.૨૭ Land, M F; Fernald, R D (1992). "The Evolution of Eyes". Annual Review of Neuroscience. 15: 1–29. doi:10.1146/annurev.ne.15.030192.000245. PMID 1575438. ↑ Breitmeyer, Bruno (2010). Blindspots: The Many Ways We Cannot See. New York: Oxford University Press. p. 4. ISBN 9780195394269. ↑ Nairne, James (2005). Psychology. Belmont: Wadsworth Publishing. ISBN 049503150x Check |isbn= value: invalid character (help). OCLC 61361417. ↑ Halder, G.; Callaerts, P.; Gehring, W.J. (1995). "Induction of ectopic eyes by targeted expression of the eyeless gene in Drosophila"". Science. 267 (5205): 1788–1792. doi:10.1126/science.7892602. PMID 7892602. ↑ Land, M.F. ; Fernald, Russell D. (1992). "The evolution of eyes". Annu Rev Neurosci. 15: 1–29. doi:10.1146/annurev.ne.15.030192.000245. PMID 1575438. ↑ ૧૭.૦ ૧૭.૧ Fernald, Russell D. (2001). The Evolution of Eyes: Where Do Lenses Come From? Karger Gazette 64: "The Eye in Focus". ↑ ૨૧.૦ ૨૧.૧ ૨૧.૨ Wilson, M. (1978). "The functional organisation of locust ocelli". Journal of Comparative Physiology. 124 (4): 297–316. doi:10.1007/BF00661380. ↑ Ritchie, Alexander (1985). "Ainiktozoon loganense Scourfield, a protochordate? from the Silurian of Scotland". Alcheringa. 9: 137. doi:10.1080/03115518508618961. ↑ Ali, Mohamed Ather; Klyne, M.A. (1985). Vision in Vertebrates. New York: Plenum Press. p. 8. ISBN 0-306-42065-1. ↑ ૨૮.૦ ૨૮.૧ ૨૮.૨ ૨૮.૩ ૨૮.૪ ૨૮.૫ Land, M. F. (1989). "The eyes of hyperiid amphipods: relations of optical structure to depth" (PDF). Journal of Comparative Physiology A: Sensory, Neural, and Behavioral Physiology. 164 (6): 751–762. doi:10.1007/BF00616747. ↑ Zeil, J. (1996). "The variation of resolution and of ommatidial dimensions in the compound eyes of the fiddler crab Uca lactea annulipes (Ocypodidae, Brachyura, Decapoda)" (PDF). Journal of Experimental Biology. 199 (7): 1569–1577. ↑ Curtis D. Klaassen (2001). Casarett and Doull's Toxicology: The Basic Science of Poisons. McGraw-Hill Professional. ISBN 0071347216. OCLC 47965382. ↑ Barlow, Horace Basil; Mollon, J. D (1982). The Senses. Cambridge: Univ. Pr. p. 98. ISBN 0521244749. ↑ ૩૭.૦ ૩૭.૧ ૩૭.૨ ૩૭.૩ ૩૭.૪ Goldsmith, T. H. (1990). "Optimization, Constraint, and History in the Evolution of Eyes" (PDF). The Quarterly Review of Biology. 65 (10000): 281–322. doi:10.1086/416840. PMID 2146698. વિકિમીડિયા કૉમન્સ પર Eyes વિષયક વધુ દ્રશ્ય-શ્રાવ્ય માધ્યમો (Media) ઉપલબ્ધ છે. આ પાનાંમાં છેલ્લો ફેરફાર ૨૪ ડિસેમ્બર ૨૦૧૮ના રોજ ૧૨:૫૫ વાગ્યે થયો.